As 2018 draws to a close, we take a look at the top equity mutual funds that weathered the rough waters of the market. While Large Cap stocks carried forward the rally of 2017 into 2018, Mid Cap and Small Cap stocks suffered from the start of the year. Fund houses were seen avoiding Mid-cap and Small-Cap stocks post SEBI’s reclassification of mutual fund schemes. This lack of interest from fund managers was one of the reasons the correction in mid-and small-caps was so severe. 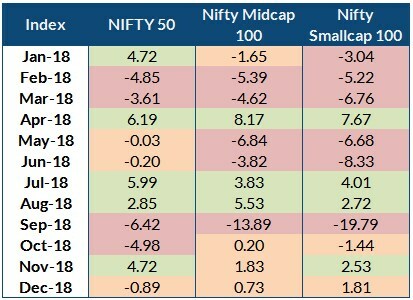 Despite the rough start, the Nifty 50 remained resilient for most of 2018. In September 2018 though, the IL&FS crisis, rising crude oil and the depreciating rupee, brought the bellwether index under pressure. As crude oil prices eased and rupee stabilized, the 50-stock index recovered its lost ground to raise itself above water by the end of the year. For CY2018 till date, the Nifty 50 managed to close with a gain of 2.37%, while the Nifty MidCap index and Nifty SmallCap index closed in the red with returns of -16.57% and -28.03% respectively. Now let’s have a look at how equity mutual funds performed. Given the volatile markets and fund houses restructuring their portfolios to comply with SEBI regulations, it was a tough year for equity funds. 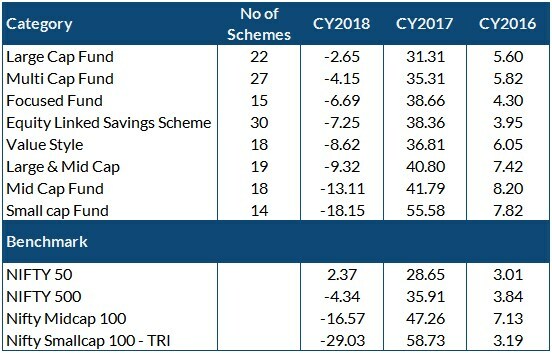 Not only did most schemes plunge into the red, many schemes even struggled against their benchmarks. 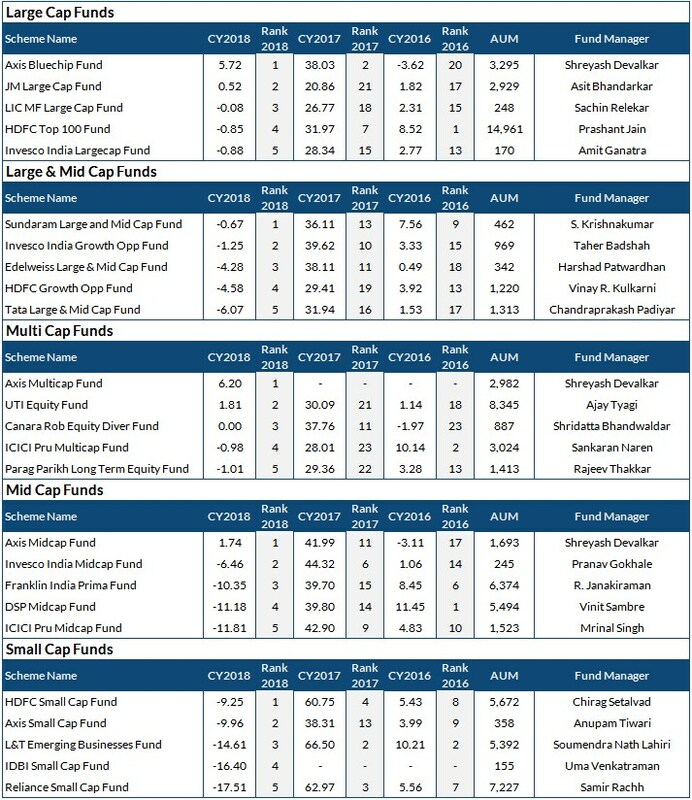 As seen in the table above, Large Cap funds ranked on top in terms of returns. Schemes with an exposure to mid-cap and small-cap stocks suffered. The performance across categories in 2018 is in sharp contrast when compared to the performance in CY2017. Investors, who entered the market expecting a performance of 2017, would have surely been disappointed. Mutual funds come with a familiar disclaimer – “Past performance is not an indicator of future results.” Using the same principle, one should note that a top scheme of the past, may not necessarily remain a top performer in the future too. Our analysis of mutual fund performance proves this further. We compare the ranks over the past three calendar years. Barring a few outliers, there is no stability in performance. For example, a scheme ranked 1 in 2016, fell to rank 14 (out of 18) in 2017, and came in at Rank 4 for 2018. There are several such instances, as you will see in the tables below. Thus, there is a need to have a robust process in place to indentify top schemes. We will explain more on this after the tables. Do note, we have exclude schemes with an AUM of under Rs 150 crore. 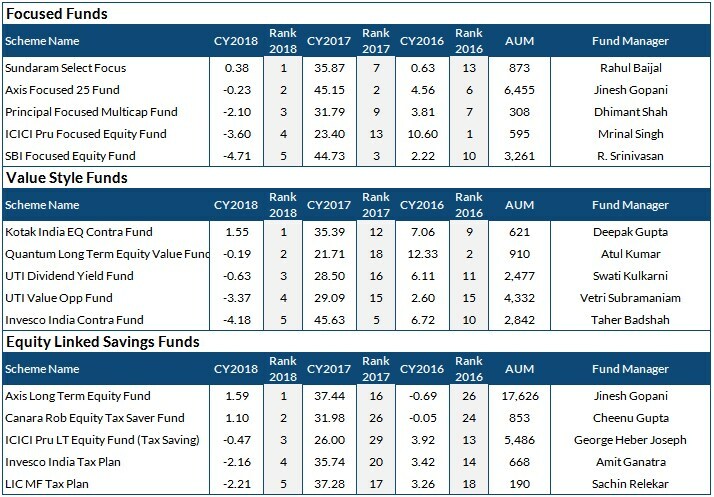 Which are the Top Mutual Funds for 2019? As we highlighted earlier, just because a fund performed well in CY2018, it do not construe that the fund will do well in 2019 as well. There are multiple factors to look at. Choosing the right fund is more crucial than picking the best performing funds. One needs to look at quantitative, as well as, qualitative factors when short-listing mutual funds. The quantitative aspect should cover how the fund has performed on a risk-adjusted basis (Sharpe Ratio is a good indicator) over multiple timeframes, spanning from 1-3 years, and if it has generated an above-average alpha versus the benchmark over the periods. Apart from this, one needs to look at the fund house and fund manager pedigree before zeroing on the right fund. You may also download our Monthly Newsletter here. The newsletter consolidates the market views of top fund houses, basis which, we create three model portfolios with a tactical asset allocation strategy. If you have any queries on mutual funds, write to us at WMS@plindia.com. You can check with us on our latest recommendations or send us your portfolios for a free -no obligation review! India VIX Vs Nifty : A See Saw!